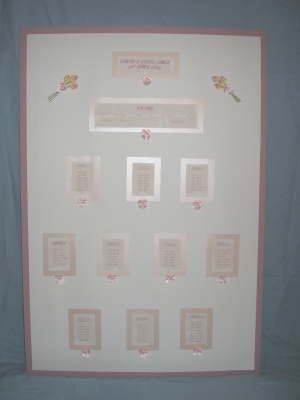 A White A1 card seating plan with a pink boarder. Contains all the table numbers with guests names printed in pink onto white card and mounted onto pink pearlescent card , finished off with a pink bow per table and pink calla lillies to decorate. This seating plan is a guide line to what is available, all plans are made to your personal wedding details.